All photos by Annie Lipton. Follow her on Instagram HERE. 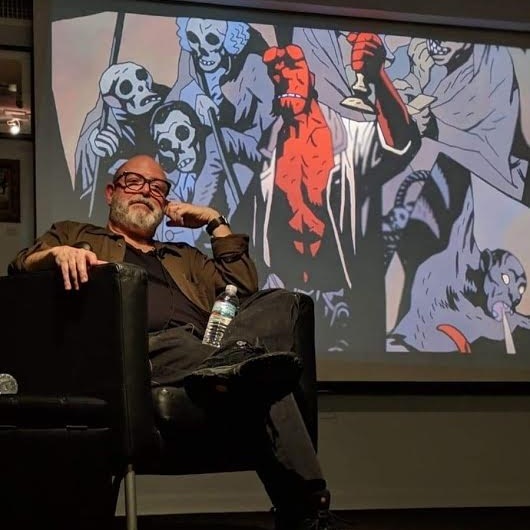 Wednesday, February 6th, The Society of Illustrators hosted “An Evening With Mike Mignola.” I had a front row seat , and it was a fun and interesting lecture. Mike came out and explained that he had absolutely no agenda. The direction of the lecture was completely in the hands of those attending, all we had to do was ask questions. He opened up by telling us that his lawyer reached out to him, add that he should stay calm. The audience laughed, and he clarified that he never speaks to his lawyer unless it's something about a movie. Maybe he's getting good news about future installments? Maybe a Baltimore Netflix series? Let's all speculate, because nothing bad ever happens when you make up rumors. He touched on his process, which involves lots of television. He explained that he is constantly surprised that he keeps succeeding. We found out that Joe Golem was his backup plan in case Hellboy tanked after the films, and to his surprise, it never tanked. He encouraged the audience to read the original Pinocchio, as it influenced so much of his writing, and that it is profoundly disturbing. He encouraged a young aspiring comic writer/artist to push through the bad by explaining how he pushed through. After two hours of Q&A, the audience was invited to a reception upstairs on the third floor, where Mike set up at a table to meet, greet, and sign autographs. The spirits were high and there was positive mingling. I personally obtained a copy of Hellboy in Hell issue 1 and had it signed, and guess what? It's going to be given away at a future date on our Instagram page. If you have Instagram, follow us @mignolaversedotcom, and stay tuned for the contest details. The Society of Illustrators is an international organization, supporting art as a way of bringing people together. In NYC, there’s an event every Tuesday evening from 5pm-8pm with free entry, and you can come see what they have on display. Their curators never disappoint. Currently on display in the second floor gallery is a retrospective of original Brenda Starr art by the late Dale Messick which runs until March 23rd. The third floor is original Marvel art, celebrating the World of Stan Lee, which runs until March 30th. Sep 16 It's Mike Mignola's Birthday!